The tale of two cities finished scoreless at Turner's Cross last night. While Cork City claimed their first clean sheet, they were unable to find the net, though they did have the better chances. The game took a while to get going and never really sparked in the first half, with neither side going close until a pair of opportunities for the home side shortly before half-time. Cork, having had their first win at Sligo on Monday, were unchanged but still not flowing with confidence and Derry looked to test them with balls in behind but the home defence, with Shane Griffin impressive, stood firm. It was Griffin who went closest to an opener in the first half, a low shot off the post and wide, while his cross for Liam Nash on 37 minutes drew an acrobatic shot but one which was off target. 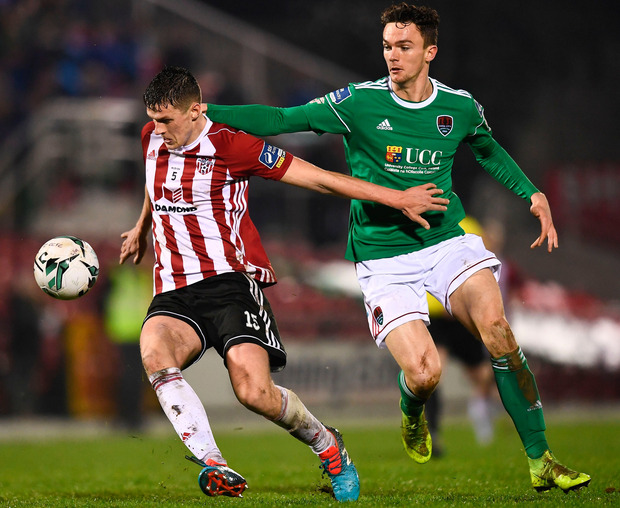 Less than a minute into the second half, Derry's Junior Ogedi-Uzokwe nearly played in Barry McNamee but Seán McLoughlin intercepted, while Ally Gilchrist's long-range effort was tipped over by Mark McNulty. Beyond that though, Cork were likelier to score. Sub Dan Smith headed wide from Colm Horgan's cross and Conor McCarthy went close following a corner. CORK CITY - McNulty; McCarthy, Casey, McLoughlin (Horgan 58), Griffin; McCormack, Morrissey; D O'Connor (Tilley 58), Buckley, Sheppard; Nash (Smith 77). DERRY CITY - Cherrie; Cole, Toal, Gilchrist, Coll; Harkin, Sloggett; Ogedi-Uzokwe (Stokes 60), McNamee, McCrudden (Delap 71); Parkhouse (Seraf 88). Cork City have now gone six Premier Division games without a win after they couldn’t break down Sligo Rovers at Turner’s Cross. Dundalk returned to second in the Premier Division table with a hard-earned win over UCD at Belfield.